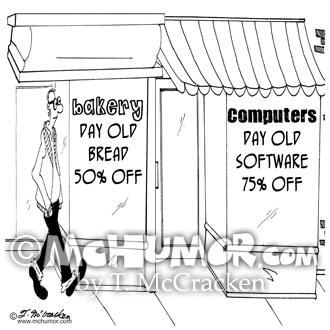 Software Cartoon 7683: A bakery selling "Day old Bread, 50% off" next to a computer store selling, "Day old software, 75% off." 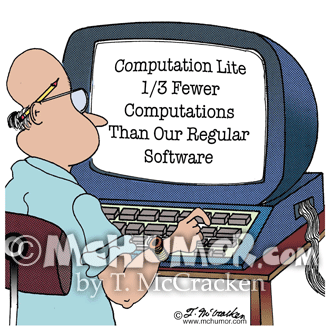 Software Cartoon 5805: A disk that says, "Computation Lite, 1/3 Computations Than Our Regular Formulas." 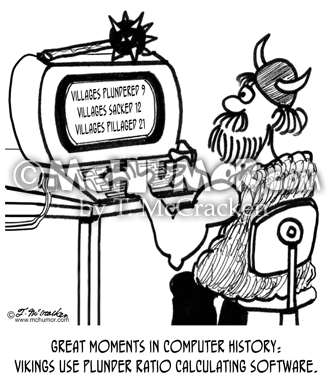 History Cartoon 2623: Great Moments in Computer History: Vikings use plunder ratio calculating software. 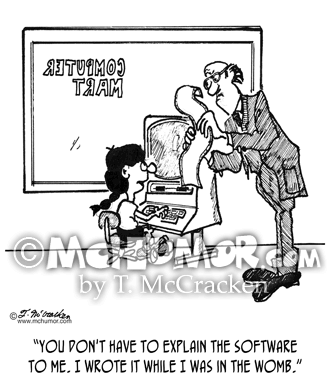 Software Cartoon 2384: A little girl says to a computer salesman, "You don't have to explain the software to me. 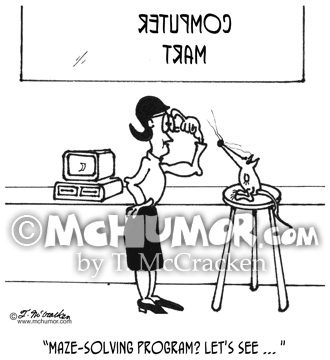 I wrote it while I was in the womb." 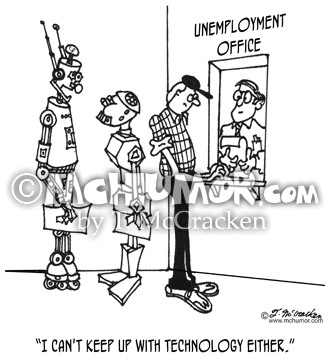 Unemployment Cartoon 3623: A robot in an Unemployment Line says to another, "I can't keep up with technology either." 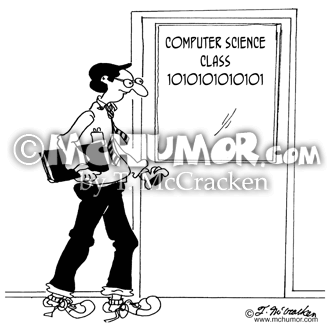 Computer Cartoon 5124: Sign on classroom door, “Computer Science Class 10101010101"
Software Cartoon 2610: Great Moments in Computer History: Al Capone selling bootleg software. 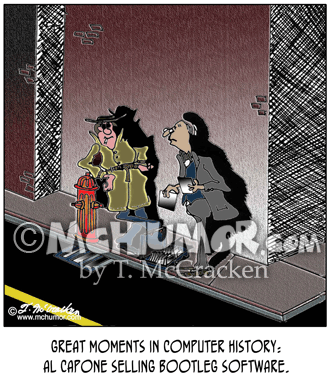 Software Cartoon 2841: A computer sales clerk says to a rat, "Maze-solving program? 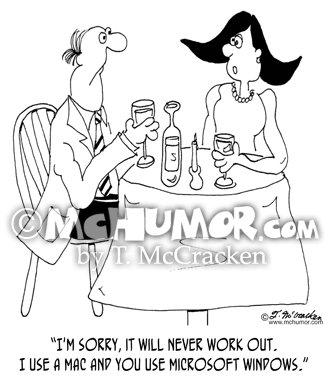 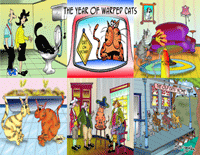 Let's see ... "
Computer Cartoon 8030: A woman says to a date, "I'm sorry, it will never work out. 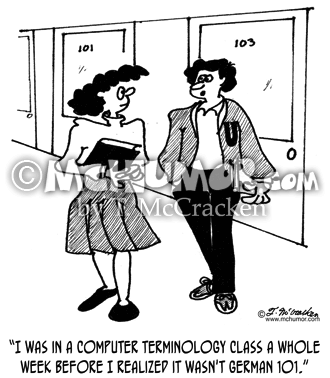 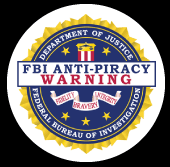 I use a Mac and you use Microsoft Windows."